We now offer Concentrated Room Sprays which are available in all of our fragrances! 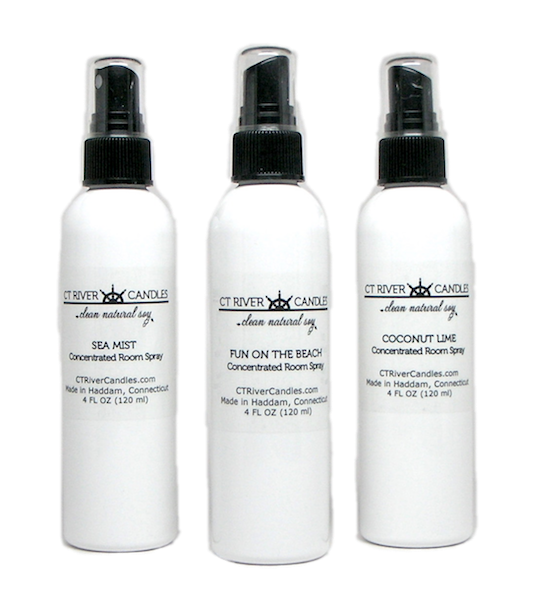 The 4 oz White Glossy Bottle with a Black Fine Mist Sprayer give these and upscale look and provide a quick and easy way to scent a room. Please refer to our Scent List for a description of the fragrances. A great product! One quick spritz is all that is needed and the scent lingers for a long time. I've been a big fan of CT River Candles and their creator, Brenda Hunter, for years. So when I discovered that she was making sprays, I knew absolutely that this would be a wonderful product. I purchased both the Pumpkin Souffle and Beach House and couldn't be happier. They're really great when you don't have time to burn a candle. And the sprays are of the same excellent quality as the candles. I can't recommend the candles and spray highly enough! And, in addition, Brenda Hunter is just a wonderful, ethical, funny artist in this genre. CANDLES OR SPRAYS, WHATEVER SCENT, IT'S ALL GREAT!